Some brides relish the thought of marrying in their local church and having the reception at home or in a nearby venue. It’s special to them. For others, the church down the road is reminiscent of a friend’s wedding or a relative’s funeral – or it just bears no meaning at all. Luckily for couples who want to get married somewhere unique and different, marital traditions are changing. Nowadays, any hall, warehouse, restaurant, hotel, garden, barn, terrace, boat, park, space or landmark can be turned into a wedding venue! 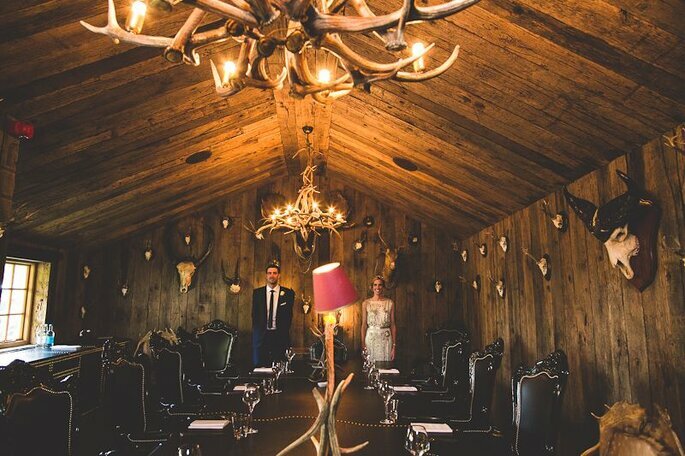 As a result, the UK boasts a plethora of alternative wedding venues that will both shock and amaze your guests, making yours an unforgettable experience for all involved. From museums, to aquariums, to tents and greenhouses, here at Zankyou we have picked our favourite venues that the country has to offer. They range from historic to bizarre, from creative to wonderfully simple… but each one has the potential to host to your unique wedding. 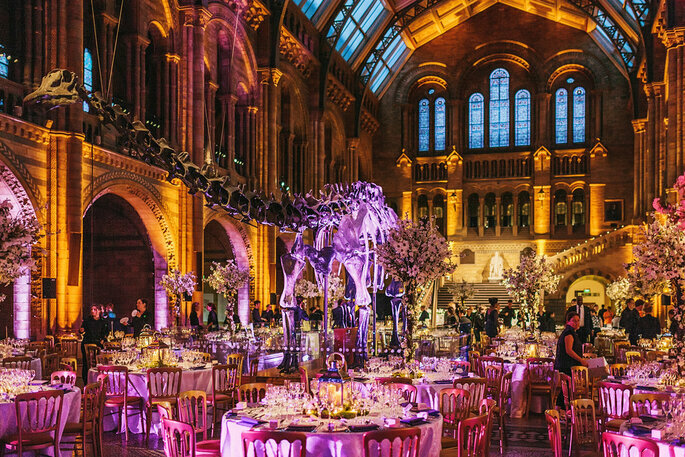 If normal venues are too mainstream, then go as far as considering The Natural History Museum, our capital city’s spectacular landmark, for your weird and wonderful wedding. Celebrate after the ceremony surrounded by family, friends and dinosaurs. Just marvel at the picture above. It would be impossible for any guest to forget your wedding, wouldn’t it? 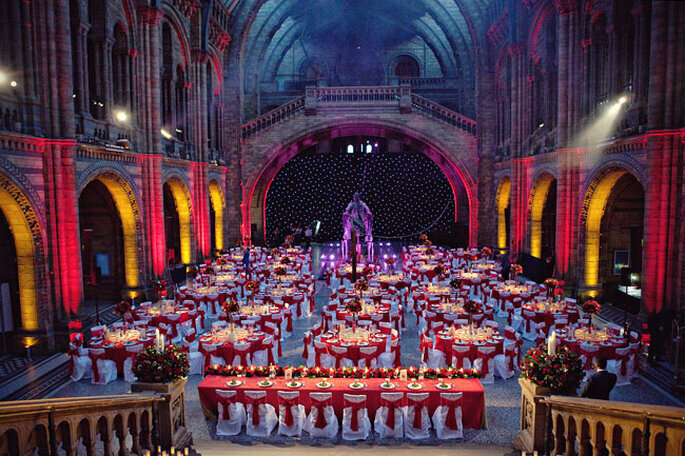 Their three venue spaces: The Hintze Hall, The North Hall and The Earth Hall, are all equally as spectacular, and range in capacity from 40 guests to 2500. Each one provides a romantic, grand and unrivalled backdrop to your day, which will no doubt be majestical. 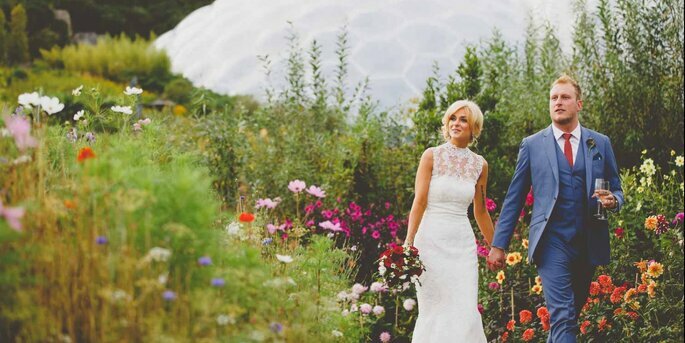 If you haven’t heard of The Eden Project, then picture this: the largest indoor rainforest in the W O R L D.
This unique environmental wedding venue gives you the chance to have an exotic wedding in either the Med or the Amazonian Rainforest without having to go further than Cornwall. Your wedding photos will have an unparallelled backdrop: think waterfalls, rare plants, and the chance to make an entrance by flying down their SkyWire. As night falls on the Eden Project, your surroundings become even more spectacular. The Medittereanean Biome is illuminated to mirror a starry night, and your celebration will be nothing less than magical. 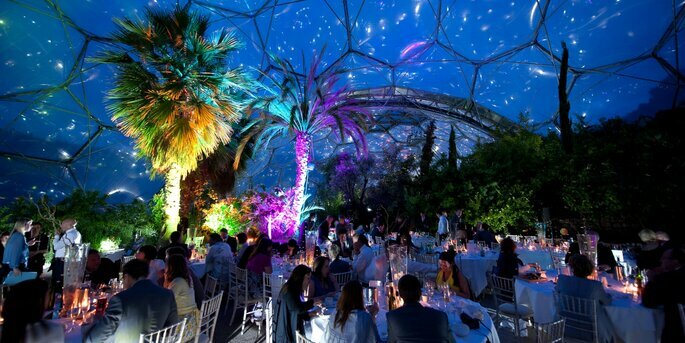 The Eden Project has a dedicated team of event experts who will make the whole planning process stress free. So if you are an environmental fanatic or just fancy getting hitched in a unique venue, what are you waiting for? If getting married in the middle of a rainforest doesn’t float your boat, then how about in the middle of the ocean? You don’t even need to go abroad. Solent Forts are a collection of four man-made forts, built originally to protect Portsmouth from a seabourn attack in the 19th century. They have now been transformed into a museum, luxury hotels, and your future wedding venue. 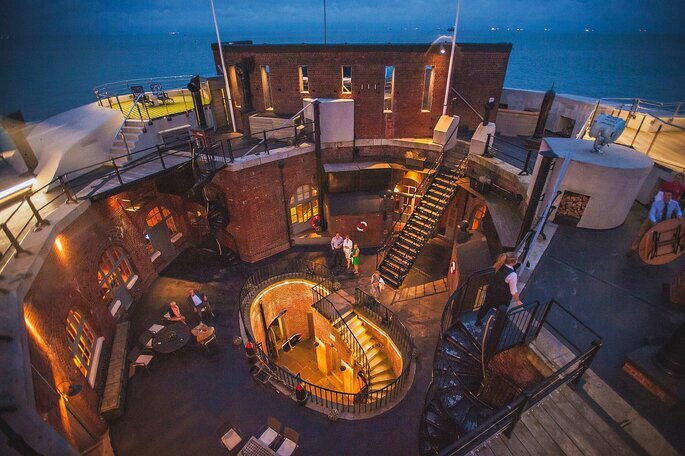 The two historical mid-ocean floats that are available for exclusive weddings are Spitbank Fort and No Mans Fort: in both cases, you and your guests will be transported to an unforgettable fortress in the middle of the ocean. Both forts take romance and exclusivity to a whole new level: they are only accessible by speedboat. 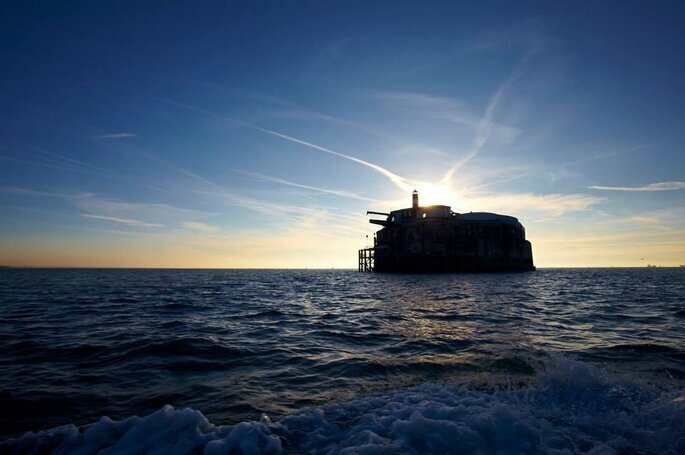 No Mans Fort is three times larger than Spitbank: on top deck you will find firepits and jacuzzis, and your reception can hold up to 200 people, with a hotel onboard that can sleep 44 guests. We have always pictured our future wedding through the dreamy haze of fairytale. Growing up, our daydreaming could be as far-fetched as we wanted. At the same time, as children, didn’t tree-houses just seem like the best idea ever? Can you imagine being told as a child that you could get MARRIED in one?! The beautiful Alnwick Garden surrounding Alnwick Castle in Northumberland, is home to the largest wooden treehouse in the world. 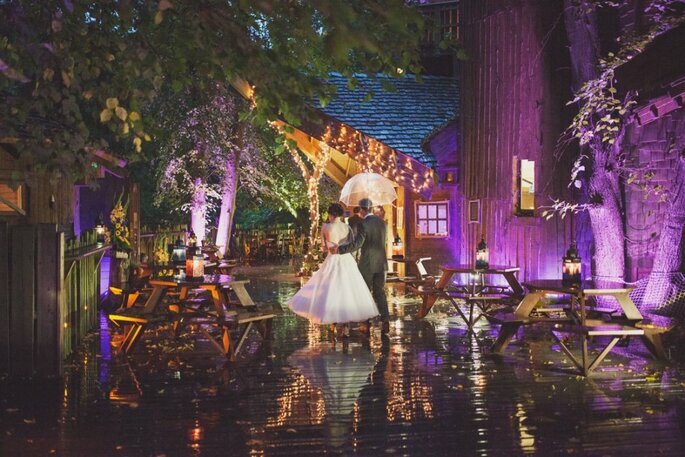 You can get married under an enchanted canopy of tree tops, on the wooden deck or inside this rustic-chic, fairytale venue. This treehouse can be perfect for any season, too. Whether you want to celebrate outside in summer months or among the falling Autumn leaves, or be be cosy inside at your winter wedding, with a real log fire and tasty food. Stars or no stars, the twinkly fairy lights both indoors and outdoors will establish an extraordinary atmosphere and romantic backdrop. 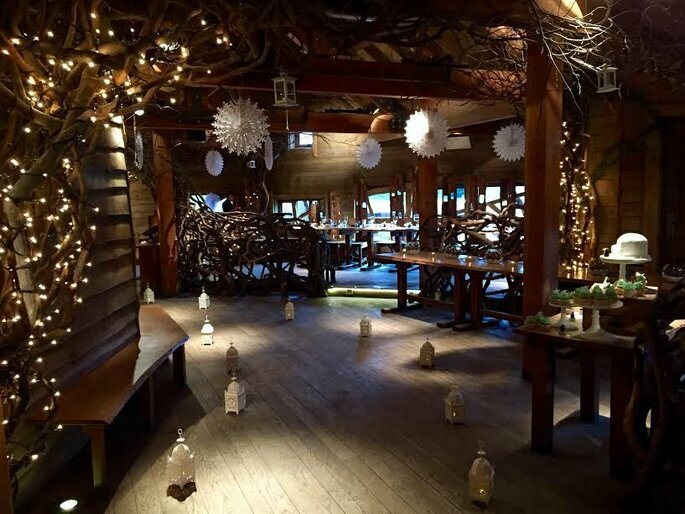 At this venue, you can enjoy locally produced food and tantalising cocktails, in an intimate and unforgettable reception for up to 85 guests. 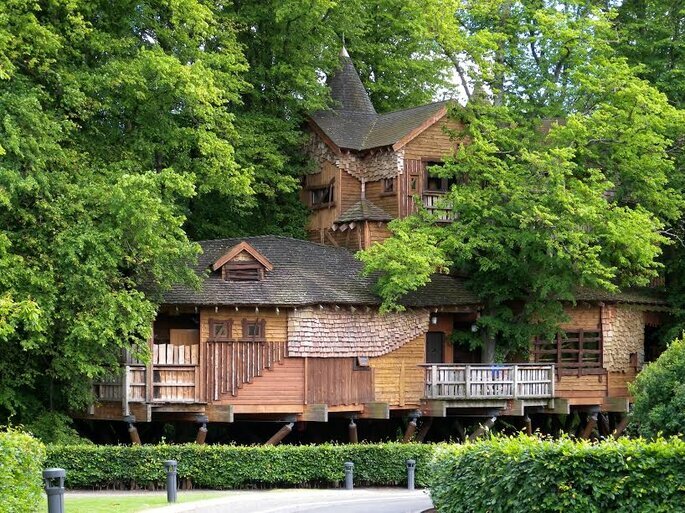 With a license for ceremonies and civil partnerships, this incredible treehouse really does make magic happen. There’s no venue in the UK quite like The Roman Baths. As one of England’s National Heritage sites, hot water has been in use here for over 2000 years, heated deep underground by the earth’s core. Throughout time, the venue has been constructed and developed into what it is now: the pillars surrounding the water are reminiscent of ancient Roman temple grandeur, and make for the perfect backdrop to your wedding. Doesn’t it look magnificient? The Romans built a religious spa complex, and now it can be your wedding venue! What is perhaps even more amazing, is that you can opt for a sunset cermony by The Great Bath, which starts at 7pm. Here you will not only be surrounded by your loved ones, but by flickering torchlight and rising steam from the hot water. 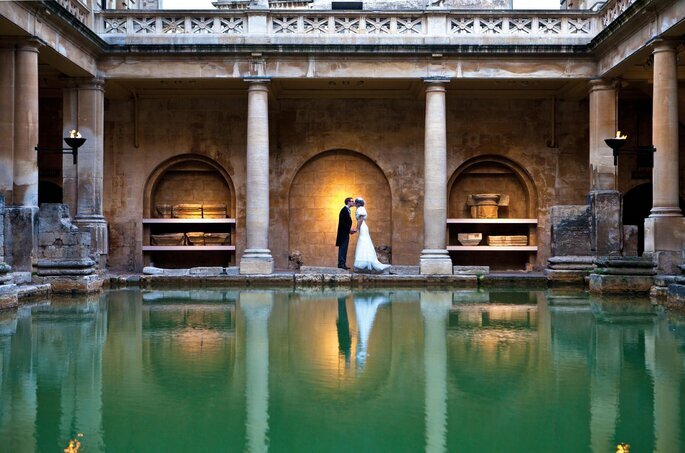 As well as The Great Bath, this venue has other beautiful rooms in which to hold your reception. 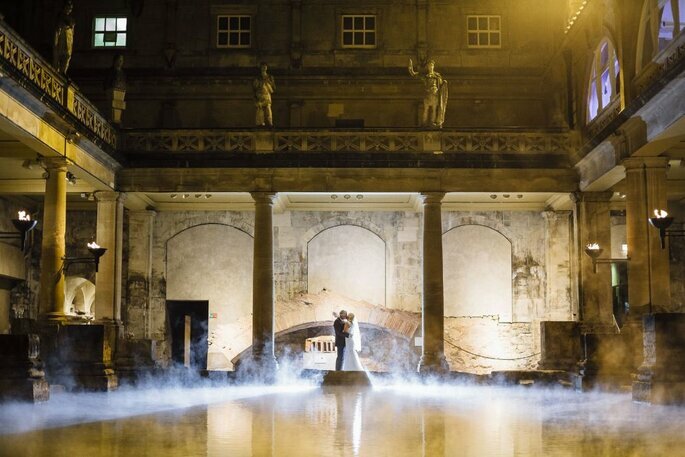 After drinking champagne amidst the steam of the baths, your guests can enjoy an exquisite meal in The Pump Room, or revel in the atmospheric Reception Hall and Terrace. As a result of having a variety of function spaces, this majestic and historical venue can cater for up to 200 guests. Whether you are a keen rugby fanatic or just looking for a fabulous venue in Greater London, then consider Allianz Park! It is, yes, the home of Saracens rugby, but it is also a flexible and spectacular venue that can hold from 10 to 700 people. 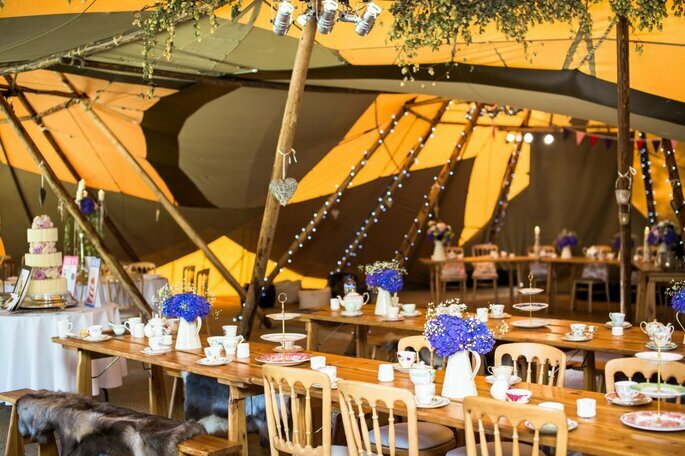 Think first class caterers, vast outdoor spaces, and many function rooms ready for you to add your own personal style. The Tulip Lounge can hold up to 300 people for dinner, and you and your guests will have access to a private terrace with panoramic views of the rugby pitch, which is a sight to behold at sunset. Despite its central location, (only 20 minutes from London Kings Cross), Allianz Park has unrivalled outdoor green spaces. So for summer weddings, how about a canapés and drinks reception outside, just metres from the nationally renowned rugby pitch? This restaurant and hotel is an absolute gem. Its decor alone will be unforgettable for whoever attends your special day! Each function room is tastefully and creatively decorated, comparable to no room you have seen before. This luxurious world, acting as the antithesis to bland hotels, has a swanky Cocktail Bar, a rustic Hunting Lodge, a bohemian Moroccan Lounge, a black and gold Library, an English restaurant, a Thai restaurant, and 33 individually designed, luxury bedrooms. You will wow guests in any corner of this wonderfully bizarre venue, and on the plus side… you won’t need to worry about decoration! So, with Solent Forts, we’ve established that it’s possible to get married on the water, and with The Roman Baths, you can get married by the water. 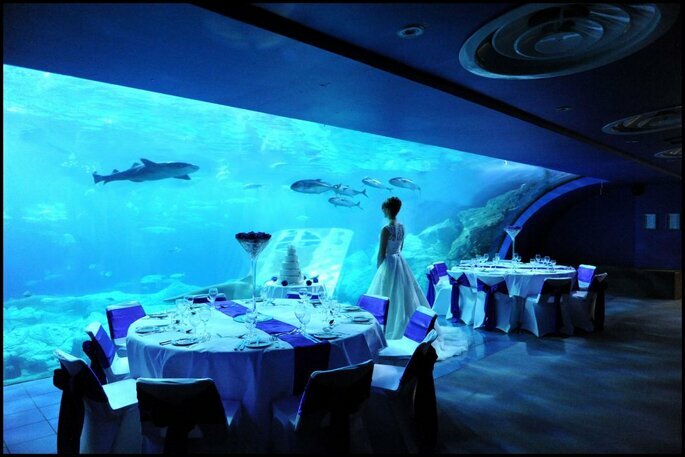 But how about getting married UNDER the water. 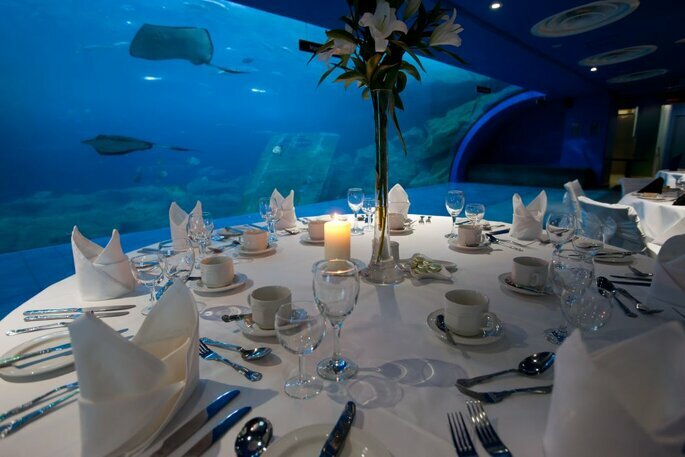 Yes, The National Marine Aquarium in Plymouth is not only the country’s most popular aquarium, but it’s also a wedding venue. Celebrate getting hitched, surrounded by the calming ripples of the most exotic and beautiful variety of marine life on earth. You can really take the ‘something blue’ tradition to the next level. This £22 million backdrop to your wedding, welcomes 300.000 visitors per year for its awe-inspiring exhibits. Their professional events team will ensure that your wedding goes S W I M M I N G L Y, and you can be extra calm knowing that scientists have proved the therepeutic quality of aquariums. Rather than going extravagent with a national museum or aquarium, you can instead go wonderfully simple. 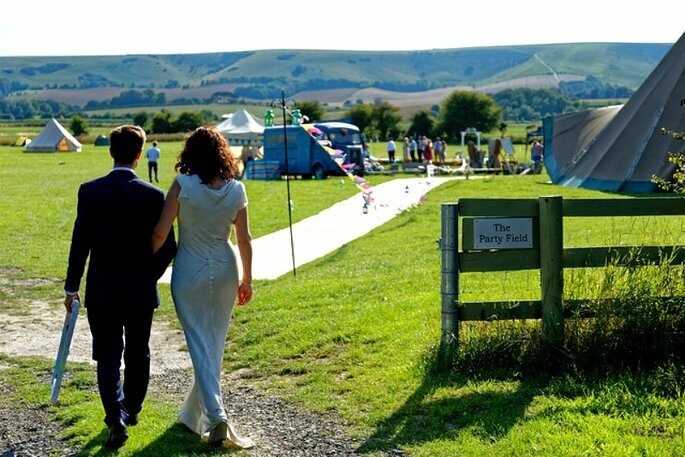 The Party Field does exactly what it says on the tin: it is a blank canvas upon which you can design a ceremony and reception of any size, to suit your tastes. 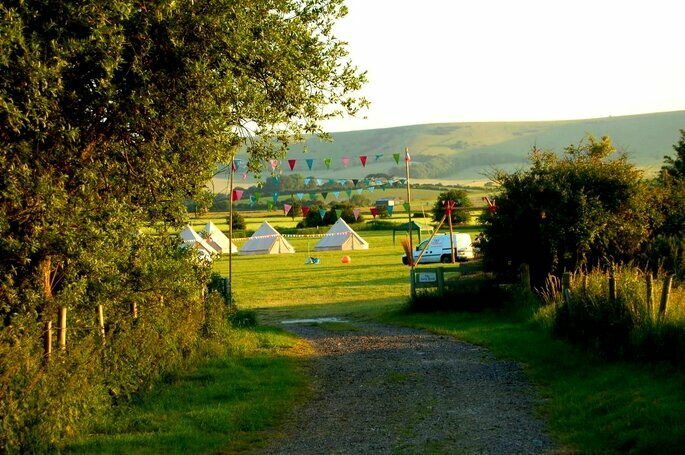 Think tipis, festival vibes, barbecues, live music, hay bales or even a whole circus, anything weird, wonderful, unique, bizarre, quaint or quirky is possible with this venue. What’s so great about this venue, is that your wedding doesn’t have to stop at the time any other reception venue may close. You can have The Party Field for the whole weekend, so your guests can camp in the same place that you have laughed and danced the night away, and the next day you can continue the festivities with a barbecue. With The Party Field’s team of event organisers, and their good relationships with vendors and hire services in the area, you can tailor this ordinary field into an extraordinary wedding day. Instead of tying the knot in a brick building, how about a glass capsule? A capsule that is one of 32 capsules on the landmark that is more visited per year than the Taj Mahal. 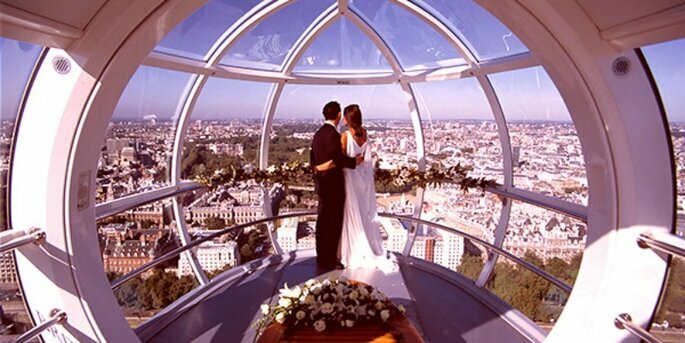 Yes, a private wedding ceremony capsule on the London Eye allows you to get hitched in front of the romantic backdrop of London’s skyline, of which you can see 40 kilometres worth, from all directions. 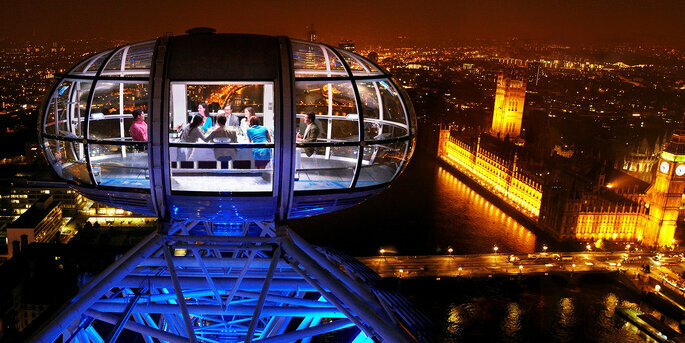 A ceremony on The London Eye lasts for two rotations: the first for you to say your vows high above our capital, and the second to sign the register, celebrate with champagne and take some artistic photos. This ceremony venue is perfect for couples that love a cosmopolitan lifestyle, and want to say ‘I do’ in an exclusive pod with panoramic views: nothing quite beats the London skyline at sunset. So there you have it, Zankyou’s top pick of alternative wedding venues that our small but wonderfully varied country has to offer. These venues couldn’t be more different from one another, in fact, none of these venues are comparable to any other in the country. But that’s precisely the point. You could get married in a field, a rugby stadium, an aquarium or a museum, it doesn’t matter. But what does matter is that you can be as unique, original or bizarre as you like, especially when it comes to your wedding. If you’re still not sure about getting married in the chilly UK temperatures, why not jet off to sunny Spain for your wedding? Its sandy beaches, beautiful cities and fascinating culture make it an ideal location for you to tie the knot. One particular city which continues to grow in popularity at lightening speed is Barcelona and we would totally recommend the Hotel W Barcelona as a perfect location to celebrate your marriage. They can accommodate between 25 and 700 guests, serve delicious food for every taste and provide fabulous accommodation for you and your guests. What more could you ask for?